Moorni Wooden Wall Shelves With Handpainted Terracotta Vase & Pots - EL-002-058: This classy wall shelf has been made to add life to your wall. In like manner has 1 handpainted terracotta vase and 3 handpainted terracotta pots on this rack. Alongside the Warli Art, ghungroos have been affixed at the base of the rack. The wooden shelf adds a class and sheen to the wall or the divider. 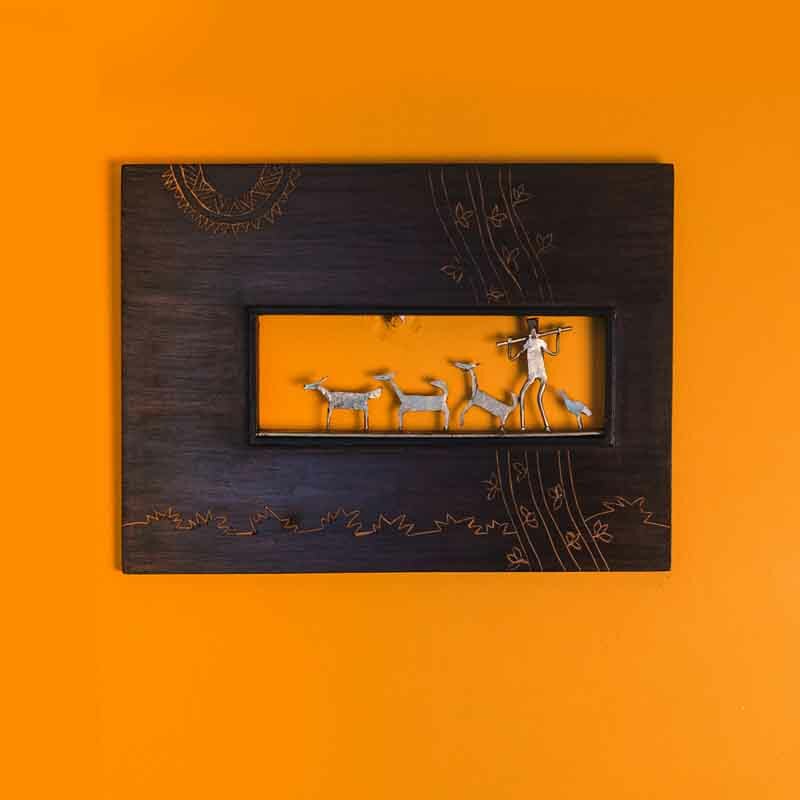 Can be hung on the wall to display any range of décoratives, sculptures, vases, Idols , momentos, collectibles or other items. Comes with 1 Wall Shelf & 3 pots. Comes with 1 Wall Shelf, 1 Vase & 3 pots. 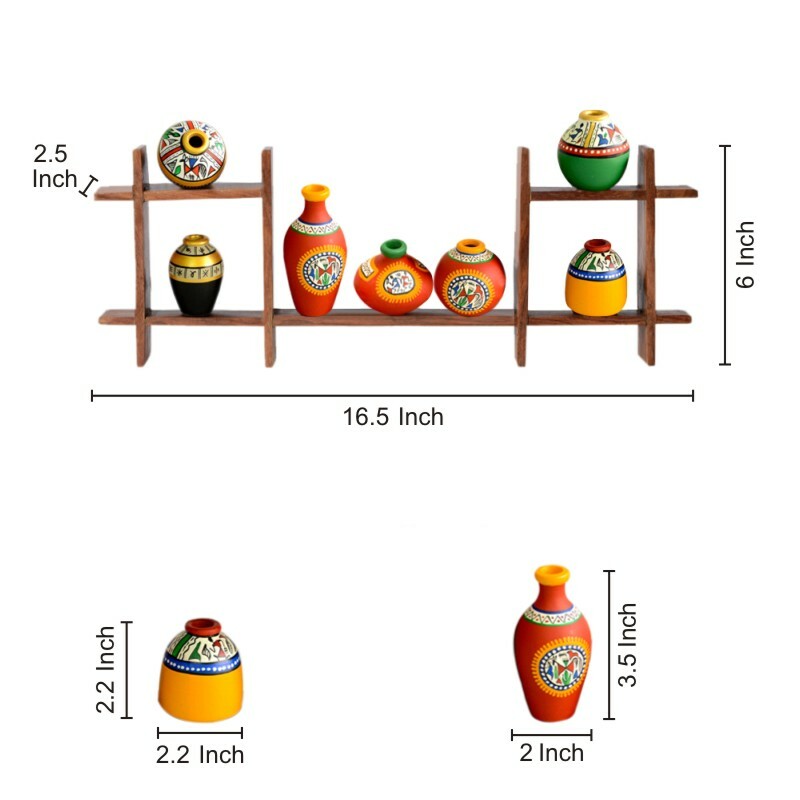 Shlef: 9.6" (L), 2.0" (W), 20.9" (H)"
Moorni.com is a best shop to buy Handicrafts, Handmade Products, Home & Garden Decors, Arts, Paintings and Moorni Wooden Wall Shelves with Handpainted Terracotta Vase & Pots - EL-002-058 in Dubai, Abu Dhabi, Sharjah, UAE. Now Shipping to Doha Qatar, KSA - Saudi Arabia, Bahrain, Kuwait, Oman in the GCC and 1 Day Delivery in UAE.